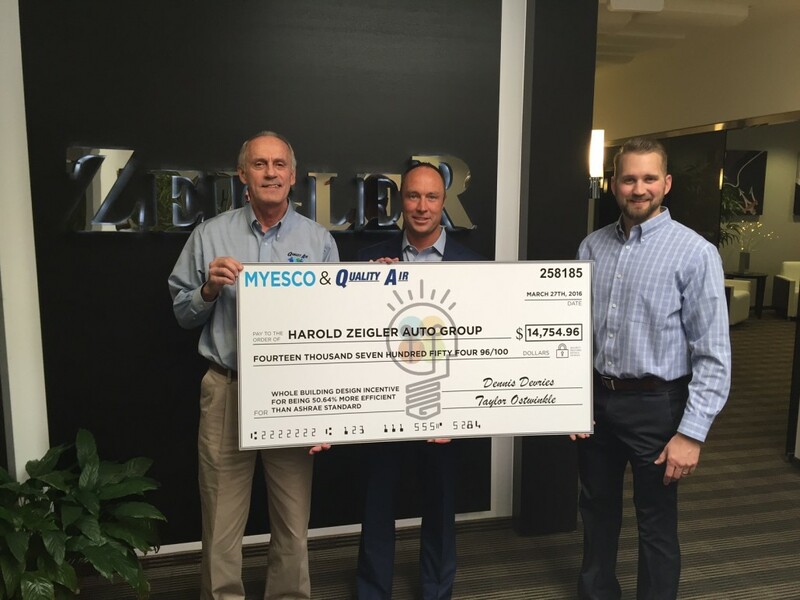 Harold Zeigler Auto Group was excited to receive their Utility Incentive check today for the strides they made in constructing an energy efficient building. A final design was established showing that the proposed new building (including HVAC, lighting, building envelope) is 50.64% more efficient than ASHRAE 90.1-2007. Be sure to stop in and see their new show room in Kalamazoo. Their team will be happy to show you around and introduce you to your next car! If you are looking to build an energy efficient building, contact MYESCO today. Our energy management experts can help you evaluate potential equipment and systems. Dollars saved in operating costs help you bring the best pricing to your customers in competitive markets. Informed decisions during the planning phase will lead to long term energy efficient performance. This will also lead to money in your pocket for qualifying designs by the Consumers Energy Incentive Program.